One of the most beautiful seasons of the year is approaching! We are lucky in Virginia to have flowers start to bloom in late winter which just wets our appetite for more. Spring in Virginia is exciting because it delivers a powerful punch of colorful flowers. It is breathtaking! Trees that bloom before the leaves come out are some of our most showy flowering trees. 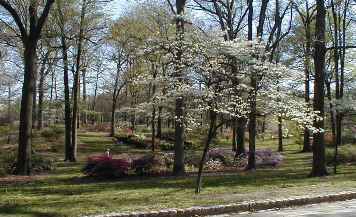 The dogwood in the photo blooms in April. The redbud tree with its lavender flowers is the perfect partner for the dogwood because it is the same size, likes the same growing conditions and blooms at the same time. There are varieties of spring flowering azaleas that bloom from April to June, so azaleas that bloom with these trees are a perfect combination as seen in this photo of Bryan Park in Richmond, Virginia. This is the time of year that you can do severe pruning. If a plant has gotten overgrown, you can remove up to 1/3 of the shrub. Prune spring flowering shrubs after they bloom. If the pruning makes it look thin, it will quickly be covered with new spring foliage making it attractive again soon. This is also true for flowering trees. Fertilizer is important for healthy plants. Essential nutrients are leached out of the soil and fertilizer replaces them. Fertilize after April 15th with any chemical fertilizers. Organics can be put down any time. Seed bare areas of your lawn. Only apply a light application of fertilizer. The majority of lawn fertilizer is applied in the fall to encourage strong root growth that is able to feed the lawn well during the stressful hot months in the summer. Fertilize bulbs after they bloom. Do not cut back or damage bulb growth until it starts yellowing. When the leaves are up is the only time of year that the bulb can produce food. Tying or cutting back the leaves too soon can shorten a bulb’s life. The task of weeding is here and never seems to let up. Use a weed killer like Round-Up to stay on top of them. Spray as soon as weeds start to emerge being careful not to get any of the herbicide on your landscape plants. For an organic approach use vinegar. Fertilizer spikes that are put in the ground around the root ball of a flowering tree feed it for months, so it gets a consistent supply of food without you having to reapply it. There are a number of good brands on the market. Pre-emergent weed control is put down in the early spring. It makes a film over the soil that doesn’t allow weed seeds to germinate. Once the film is broken down by rainfall and irrigation, it is no longer effective. Reapply it as often as the manufacturer recommends. I hope you enjoy this wonderful time of year!